Nonviolent Palestinian activists held a mock soccer match in front of the Ofer Prison, near the central West Bank city of Ramallah, to express solidarity with hunger striking detainees, and were violently attacked by the soldiers. Abdullah Abu Rahma of the Popular Resistance Committee against the Israeli Annexation Wall and Israel’s illegitimate settlements, told the Palestinian TV that, as the world attention is focused on the World Cup in Brazil, the Palestinians want to draw the world attention to more than 200 detainees who are now in near-death conditions. “In our own way, we want to draw attention to hundreds of striking detainees", Abu Rahma said, "to tell the world that hunger strike continues in Israeli detention camps”. As the Palestinian nonviolent activists, wearing T-shirts made of Palestinian flags, started their mock soccer match, Israeli soldiers attacked them, and hurled concussion grenades at them. Mohammad Khatib, coordinator of the Popular Committee, told the Palestinian TV that this activity is part of ongoing activities in solidarity with hunger striking Palestinian detainees, and called for more popular activities and massive protests to highlight the cause of the detainees, and their suffering. An Israeli airstrike on Gaza killed one Palestinian and wounded two on Wednesday evening after rocket fire from the territory on southern Israel, emergency services said. The strike, which hit the northern Gaza Strip, came little more than a week after a Palestinian unity government was sworn in, replacing separate administrations in Gaza, run by Hamas, and in the West Bank run by loyalists of President Mahmud Abbas. Palestinian medical sources have reported that one Palestinian was killed, and two were seriously injured, when an Israeli war jet fired a missile targeting a fighter northwest of Gaza city. The al-Quds Brigades, the armed wing of the Islamic Jihad, said the fighter has been identified as Mohammad Nasr (Abu Al-Khattab), 24 years of age. His body was severely mutilated when an Israeli missile struck him as he was driving his motorcycle in the Sudaniyya area. Two civilians were injured in the blast, one seriously, the Palestinian TV has reported. 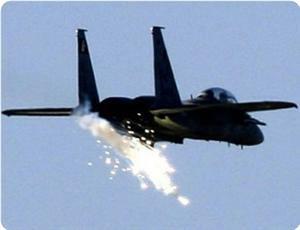 The Israeli army said “it targeted fighters planning to attack Israeli targets”. On Wednesday evening, a Palestinian child was killed and a young man was wounded in an explosion that took place in a home in the at-Tuffah neighborhood, in Gaza City, medical sources said. The child Khalil al-Ghaseen, 13 years of age, died of serious injuries he suffered in an explosion that took place in his family’s home, in Jaffa Street in Gaza City. The sources added that a young man suffered life-threatening injuries due to the blast, and was moved to a local hospital. The police are said to be investigating the causes of the blast. The Israeli forces arrested five citizens on Wednesday night during the violent clashes that broke out in the village of Esawyeh after the Israeli forces raided houses and commercial stores in the village. Locals informed Wadi Hilweh Information Center the names of the detainees, they are: 44-year old Lofty Khalil Dari, 38-year old Ali Dirbas, 19-year old Mohammad Rajab Obeid, Yaser Darwish and Mohammad Jibril Darwish. The residents said that large Israeli forces raided the village and established checkpoints in several neighbourhoods resulting in violent clashes where the forces fired sound grenades and rubber bullets towards the residents. Locals added that the forces broke into the residential houses and assaulted the residents including men, women and children and arrested some of them. Israeli policemen forcibly suppressed on Tuesday a peaceful march in occupied Jerusalem in solidarity with administrative detainees who declared hunger strike 49 days ago. Dozens of prisoners' families participated in the solidarity march outside the Red Cross headquarters in Sheikh Jarrah neighborhood downtown occupied Jerusalem, holding up their detained sons' pictures, local sources said. Large Israeli forces surrounded the protesters and suppressed the march after firing tear gas and sound bombs. Children, elderly men and women were brutally attacked and assaulted, head of the Jerusalemite prisoners' families committee Amjed Abu Assab said. He added that occupation forces arrested member of the committee Ala al-Haddad after brutally beating him. Meanwhile, Israeli forces continued to impose tight restrictions on Jerusalemite worshipers and Islamic students' entry to al-Aqsa Mosque and confiscated their identity cards. Israeli forces callously attacked the worshipers while trying to have access to the mosque. As a result, children and women suffered breathing difficulties after inhaling tear gas. The Foundation for maintaining al-Aqsa and holy shrines said that students of Islamic schools in al-Aqsa Mosque have staged a sit-in protesting the confiscation of their identity cards and the attack on children and women. In a related context, 300 Jerusalemite students gathered at Magareba gate protesting Israeli settlers' attempts to storm al-Aqsa Mosque, the foundation added. The Israeli police arrested Monday morning three students for protesting the brutal attack on children and worshipers, one of the detainees was later released. Israeli restrictions came following Israeli settlers' break-ins into al-Aqsa Mosque on Sunday headed by extremist Rabbi Yehuda Glick where they deliberately provoked Palestinian worshipers inside the mosque who gathered and forced the settlers to leave al-Aqsa squares. On the other hand, Aida Sidawi, 53, was released Sunday after being beaten and arrested on Saturday. She was released on bail in addition to being denied from having access to al-Aqsa Mosque for 30 days. The foundation called for supporting Islamic students' steadfastness in al-Aqsa Mosque. A series of home-attacks and arrest-campaigns was launched by the Israeli Occupation forces (IOF) at night Tuesday and earlu Wednesday following invasions into different areas of the West Bank. Scores of Palestinian civilians were left wounded or rounded up in the process. According to local sources, dozens of Israeli well-equipped patrols moved into al-Qaryoun neighborhood in Nablus city and rounded up the Palestinian civilian Mahmoud al-Jebali, before dragging him to an unidentified destination. The Israeli patrols raked through Ras al-Ain area with no reports of arrests, other sources reported. In a related context, the IOF broke into the Balata camp, to the east of Nablus, at dawn Wednesday and arrested the Palestinian ex-detainee Iyad Hamada, 24, after having rummaged through his home and reduced much of his property to rubble. Iyad had already spent two years in Israeli jails and is a brother to a Palestinian detainee sentenced to 15 years in prison, Iyad’s family told a PIC correspondent. The Palestinian young man Thaer Awda, a Hawara native, was also arrested at the Yitzhar crossroad. In Jenin, the IOF arrested ex-detainee Jamil Abdul Latif Nabhan, 25, after having ransacked his home late on Tuesday night. Nabhan had spent 5 years behind Israeli bars, local sources reported. In another event, scores of Palestinian youths were left severely wounded while 5 more youngsters, at least, were rounded up following IOF attacks on the al-Aroub refugee camp, north of al-Khalil, on Tuesday evening. The Israeli attacks came as a response to a peaceful protest rally staged in solidarity with the Palestinian administrative hunger strikers, without food for 48 uninterrupted days. The IOF fired rubber bullets, tear gas canisters, and sound bombs on the Palestinian non-violent demonstrators, local sources confirmed to a PIC reporter at the scene. Severe injuries among many Palestinian civilians were documented throughout. Another Palestinian youth, at his twenties, was rushed to hospital after having been shot in his head, the sources further stated. The Israeli forces suppressed on Tuesday a peaceful march that was organized by the Jerusalemites detainees and prisoners families committee and the Prisoner’s Club in solidarity with the prisoner undergoing the hunger strike, and then arrested the activist Ala’ Haddad. Wadi Hilweh Information Center said that the police and Calvary unit attacked the peaceful march that initiated from the headquarters of the Red Cross in Sheikh Jarrah towards the main street. The forces also chased the participants and prevented them from moving forward and fired a sound grenade towards them, and then arrested Ala’ Haddad after assaulting and severely beating him. Israeli soldiers, heavily deployed in occupied East Jerusalem, especially near the al-Aqsa Mosque, attacked dozens of Palestinians, including children, near Bab al-Majlis Gate (The Council Gate), and prevented them from entering the mosque. Sheikh Omar al-Kiswany, head of the al-Aqsa Mosque, said that the soldiers attacked and detained Palestinian residents, and summer camp children, trying to enter the mosque, and demanded the residents to leave their ID cards with the army before entering the mosque area. Al-Kiswany stated that the soldiers used pepper-spray against employees and workers of the Waqf and Islamic Endowment Department, in addition to attacking several men, women, children and teachers. 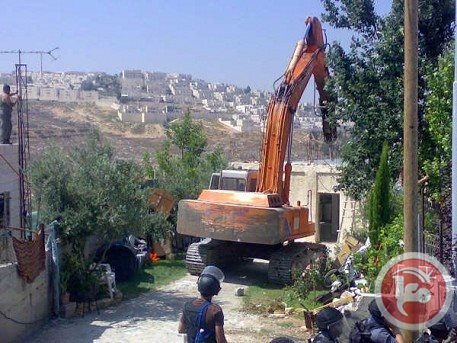 In related news, Israeli military bulldozers uprooted large areas of Palestinian lands in Wadi Al-Joz neighborhood, in the Old City of occupied Jerusalem. Eyewitnesses said dozens of soldiers invaded the area before army bulldozers uprooted the lands. The army and police also towed several Palestinian cars, mainly belonging to residents who live in the area, causing significant damage to the vehicles. A state of anxiety has overwhelmed the yards of holy al-Aqsa Mosque on Tuesday following a series of random attacks launched by the Israeli Occupation Forces (IOF) on dozens of non-violent Muslim worshippers at the al-Majlis Gate. The IOF heavily stationed at al-Aqsa gates and denied the peaceful sit-inners, along with a group of summer campers, access into their holy mosque. Tough control measures have been issued all along, Sheikh Omar al-Kiswani, Director General of Holy al-Aqsa Mosque, said in a press release. The IOF sprayed pepper gas on the Awqaf personnel and the unarmed sit-inners, including women, counselors, and a group of children who have just come to camp out around al-Aqsa, Sheikh al-Kiswani added. A number of Palestinian citizens in Yabad town, south of Jenin, were treated for breathing difficulty after Israeli occupation forces (IOF) raided their town with a barrage of teargas canisters. Local sources said that IOF soldiers attacked the village on Monday night and fired teargas and sound bombs in the town’s center. They said that a number of citizens suffered from gas suffocation, and added that confrontations erupted with young men in the town that lasted till a late night hour. Yesterday morning on the 8th June, Israeli police forces raided the village of Iqrit (located on the northern tip of Israel, within eyesight of Lebanon). The police uprooted trees, destroyed and confiscated all the personal belongings of Palestinian activists present in the village. 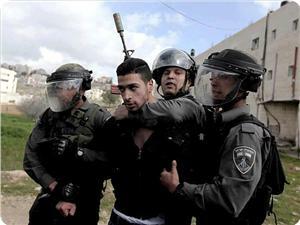 Furthermore they beat and violently arrested 3 Palestinian men who were present in the village at the time. The 3 arrested are: Walla Sbait, Nidal Khoury and Jeries Khiatt. They were taken to the police station in Nahariyya, where they were kept in detention over night. Today at 8:30 AM the three detainees were brought before the Kiryat Gat Magistrates’ Court, following a police request for an extension of their detention. The police have charged the detainees with trespassing the land owned by the ILA, obstructing the work of public officials, assaulting a public employee and endangering public order. The court ruled that Nidal Khoury is kept in detention until Wednesday 11th of June. Walaa Sbeit and Jeries Khiatt was sentenced house arrest until Sunday 15th of June and they are not allowed to go back to Iqrit for 60 days. As the season of Advent approached in November 1948, the Israeli military forced residents of Iqrit and the neighboring village of Kufr Bir’im —all citizens of the newly created state of Israel— to leave their homes near the northern border with Lebanon because of military operations in the area. The Israeli forces made a promise to the inhabitants, that they could return to their homes after 15 days. The people of Iqrit are still waiting. In July 1951, the Israeli High Court ruled that the people of Iqrit and Kufr Bir’im had the right to return to their homes. The military refused to comply, and on Christmas Eve 1951 blew up all houses in both villages. Shortly thereafter, all village lands were confiscated by the state and has been rented out to the nearby Kibbutz for their cows to graze until this day. Since then, decades of demonstrations and legal appeals for the villagers’ right to return have seen a string of favorable decisions by courts and commissions that have resulted only in more broken promises and unenforced rulings.In the 1970s, the government had granted use of the cemetery —allowing only the dead to return to Iqrit after they lived and died in exile at Kufr Yasif, Rameh, Haifa or other places. The original villagers and their descendants —now around 1,500 people scattered across northern Israel— are allowed only to hold services in the church and bury their dead in the cemetery. Every first Saturday of the month there has been a mass held at the village church and every year a summer camp has been organised on the hillside. In August 2012 the third generation reclaimed their village. Around 20 descendants from Iqrit took the initiative to begin resurrecting the village despite the village’s legal limbo. The activists make sure that the village is constantly inhabited, sleeping in tents, under the stars or in rooms attached to the church. The group consists of university students, factory and restaurant workers, and teachers. Their attempts to construct or plant anything in the village have been met with immediate demolition by the Israeli authorities. But over time, they’ve been able to add a few amenities, including solar panels on the church roof, determined to bring back life to Iqrit. Iqrit’s 80 homes are long gone, but the activists goal is to rebuild Iqrit for the villagers-in-exile, refusing only to return to their home in coffins, but alive. The activists have returned to the area and are discussing on how to proceed with their campaign, determined not to be intimidated by Israeli forces and their harassment. Israeli soldiers, stationed across the eastern border of Gaza City, fired dozens of rounds of live ammunition targeting a number of homes, and farmlands, east of the ash-Shujaeyya neighborhood, east of Gaza city. 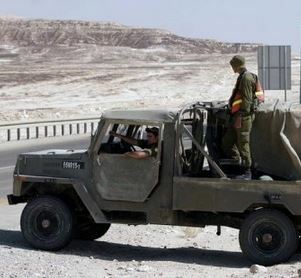 The Palestinian News & Info Agency (WAFA) has reported that Israeli soldiers, stationed near the Karni Crossing, fired dozens of rounds of live ammunition targeting several homes, and agricultural lands, causing damage but no injuries. The army alleged a homemade shell, fired from Gaza, landed near landed near the border fence, in the northern part of the Gaza Strip. The army frequently targets farmers and workers, in their own lands, in areas close to the border in the northern and eastern parts of the Gaza Strip, causing excessive property damage and dozens of casualties. Also on Monday, Israel allowed the entry of 280 trucks into the besieged Gaza Strip. The trucks were allowed through the Karem Abu Salem (Kerem Shalom) Crossing. The trucks are loaded with supplies for the trade, agriculture, and transportation sectors. Israel also said it will be pumping limited amounts of industrial fuel for the Gaza Power Plant, cooking has, and intends to allow the entry of seven cement trucks for construction projects run by the UN. Karem Abu Salem is the only terminal used for the entry of goods and fuels into the coastal region. Israeli forces demolished a Palestinian house near the northern West Bank city of Tulkarem on Monday, Palestinian security officials said. Bulldozers escorted by Israeli military vehicles raided the village of Farun at 5:30 a.m. and destroyed the home of Falah Suleiman Abdul-Rahman Ubeid, 58. Ubeid collapsed after seeing his house destroyed and was taken to hospital for treatment. Youths in the village gathered in the area and hurled stones at Israeli soldiers, who fired tear gas canisters and sound grenades. A local woman, Aisha Daoud, suffered serious breathing difficulties as a result of the tear gas. Several residents of Silwad town, near the central West Bank city of Ramallah, managed to force Israeli soldiers out of a Palestinian home that the army had broken into, and had held the family in their own home since Friday evening. The Raya News Agency published a video showing local Palestinian villagers entering the Palestinian home, and forcing the soldiers out. Moath Mashal, a local journalist and cameraman working for Raya FM News Agency captured the incident on video. The residents said that the soldiers were holding the entire family hostage in their own home, and were using the property as a military post, in direct violation of International Law. The video showed a Palestinian woman crying and telling the cameraman that the soldiers had detained the family since midnight after invading their home, and did not allow them to move around. The residents then entered a bedroom, where the soldiers were gathered, and started shouting at them “what are you doing here, get out, get out…”. As the soldiers were using their wireless communication devices, trying to communicate with their commanding officers, the residents insisted that the soldiers needed to leave the property instantly, as they had no right to be there. The Palestinians eventually managed to force the invading soldiers out of the Palestinian home, and starting clapping and chanting as the soldiers walked out of the property, its yard and the entire area. Israeli soldiers invaded Zabbouba town, near the northern West Bank city of Jenin, kidnapped an elderly man and hurled gas bombs, causing several family members to suffer the effects of tear gas inhalation. Local sources stated that the soldiers invaded the home of Hasan Thiab Abu Zeitoun, 60, and kidnapped him, the Raya News Agency has reported. The soldiers also attacked, and violently beat, his son Emad, causing various injuries. The sources added that the soldiers also hurled gas bombs into the home after searching it, causing several members of the Abu Zeitoun family to suffocate due to gas inhalation. The invasion also led to clashes between the soldiers and local youth, who hurled stones at them; several residents suffered the effects of tear gas inhalation. Local medics provided the wounded Palestinians with the needed treatment. For children in al-Khalil (Hebron), the journey to school can be filled with fear, fear of Israeli soldiers, of military weapons, detentions, and arrests. The violence is all too real in this city, and it is unfortunately not an uncommon experience for children, some as young as four-years-old. International activists try to monitor the checkpoints the children are forced to pass through on their way to school, both to document the events and to stand with the children. 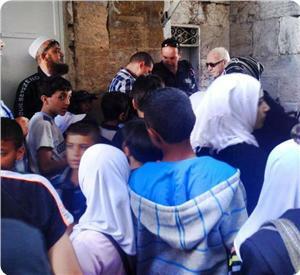 May 7th: A group of four Israeli soldiers tried to enter in the boys school and detained two young children. However, the teachers of the school were able to convince the soldiers to release both boys. After the soldiers ended the detention, they ran up the street and threw one tear gas grenade and two stun grenades at other schoolchildren. In cases like this it is clear how important the job of the teachers is in this area, and how difficult it is to is educate under military occupation. 13th May: In the morning one 12-year-old boy was stopped and searched by Israeli forces at the checkpoint, he was forced to empty his school bag before the soldiers would release him. After school ended, a 7-year-old boy was detained for 10 minutes with the accusation that he threw stones, he was released without charges. 14th May: Israeli soldiers went through checkpoint 29 in al-Khalil (Hebron), appearing from an alleyway and threw two stun grenades at the children waiting to go to school. No stones were thrown before their weapons were used. Some of the children then threw stones towards the soldiers, who then fired one tear gas grenade. One of the Israeli soldiers repeatedly aimed his gun at both an adult in the area, and the children outside their school. 15th May: One young child threw one stone towards the checkpoint and four Israeli soldiers entered through checkpoint 29. 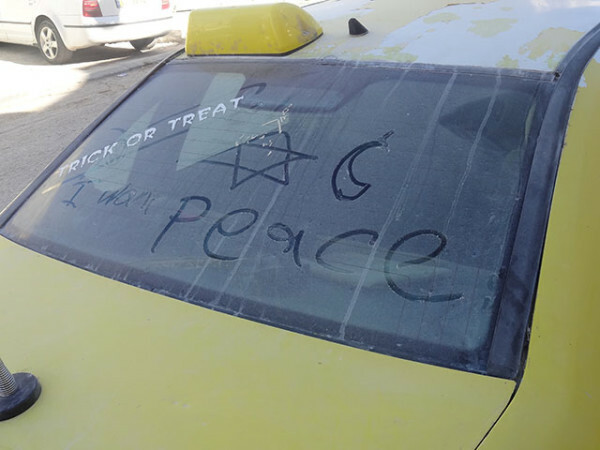 Several children then threw approximately four stones towards the soldiers, one of the Israeli soldiers drew the Star of David (symbol of Judaism) and a crescent moon (possibly symbolizing Islam) on a car window, and then wrote, ‘I want peace’. 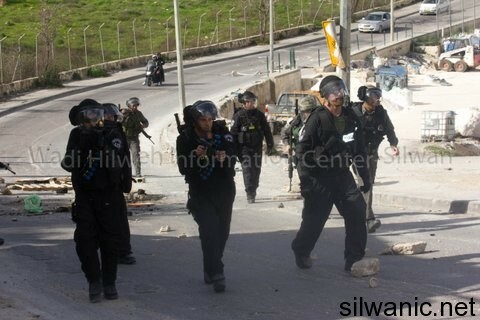 The same soldier who wrote ‘I want peace’, then threw a stun grenade at the children as they gathered to go to school. 19th May: Nine Israeli soldiers entered through checkpoint 29, several of the children then began to throw stones towards the soldiers. The soldiers then threw three stun grenades towards the children and fired one tear gas grenade. The second tear gas grenade was fired directly into Khadeagah Elementary School. An ISMer present said: “Today the children are writing one of their final year exams, it’s a terrible way to start the day and many of the kids were really afraid of both the soldiers and their weapons. This sort of aggression in the morning is common in Hebron, the soldiers don’t seem to care that they’re terrifying and tear gassing children, some as young as four-years-old”. 21st May: Several children threw stones towards checkpoint 29 on their way to school. At approximately 07:40, 13 Israeli soldiers and border police officers entered through the checkpoint and fired four tear gas grenades and four stun grenades at the children. When the exams finished in the late morning and the teachers and school children were on their way home, the harassment began again. 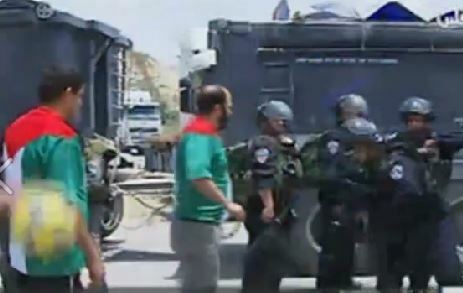 The Israeli military detained seven teachers for 20 minutes. One of the teachers spoke to an ISMer present: “We are used to this kind of violence and disturbance, the harassment is continuous and often twice a day”. 25th May: At approximately 07:50, three Israeli soldiers ran towards a group of children standing in front of their school. Some of the children threw several stones towards the soldiers. The soldiers then threw one stun grenade and fired two tear gas grenades at the children. Whilst the children was throwing stones, the soldiers were standing behind a group of internationals, seemingly trying to use them as some form of ‘shield’. The incident lasted for approximately 20 minutes, which prevented the children from entering their schools, delaying the start of their end of year exams. 27th May: In the afternoon as the children were leaving school, one Palestinian youth was detained for 20 minutes and five teachers, from the local schools, were detained for 15 minutes. No explanation was given for the detentions. 1st June: Several children threw stones towards checkpoint 29. 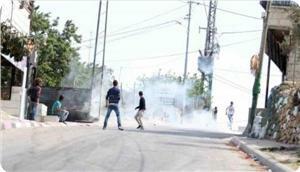 Israeli forces then fired one tear gas grenade, dangerously close to several children standing to the side of the road.